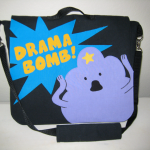 I joined an Adventure Time craft swap on Craftster a few months ago and my partner’s daughter wanted a new bag for school so this is what I came up with. It was my first time making a bag and also my first time doing any complicated applique work. I think it turned out okay! It’s all made from denim for durability except for the appliques and lining which is quilting cotton. The strap is made from nylon webbing and it has a shoulder pad thing made from padded denim and it attaches with velcro. 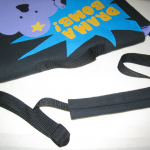 I would definitely make some construction changes on the next one I make, like having the strap attached to the bag instead of using swivel clips because they were such a pain to find and I don’t think that the strap really needs to be removable. 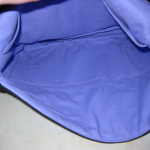 I would also change the configuration of the inner pockets, possibly including a zipper pocket in there. I’ve gotten a lot of requests for me to make more of these bags for people so I’m looking forward to doing that soon. I just have to work out pricing and maybe try another one or two just for practice, but after that I’ll be taking commissions. So if you’re interested in getting one of these, let me know and I’ll get back to you with all the details once I’ve worked them out. I wish I had been able to get better pictures of this, but I was in a time crunch to finish and send it out. I’ll get better photos of the next one I make before taking any orders.